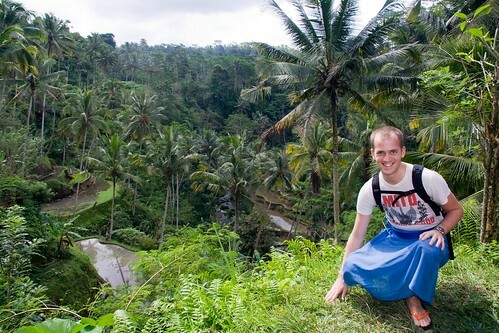 This latest post by Featured Blogger Andrew Allen is dedicated to reader Grace who is going to Bali in July and wanted to know a little bit more about it! Andrew gets off the beaten track to find out more about this enchanting country. Everyone visiting Bali knows that the beaches are stunning, and the nightlife in Seminyak is wildly enjoyable. Many a wonderful holiday has been had without ever needing to venture further afield. I like to think of that aspect of the island as ‘honeymoon Bali’. I was interested to experience this side, but as this visit to Indonesia would be my first time in a developing nation, I was mainly hoping to spend my time finding the complete opposite; something there’s no map for – real people living their lives. From the moment I arrived, I saw traces of it around every corner. The horde of taxi drivers clamouring for me at the airport. The chaos on the streets as we weaved through infinite scooters, many of them with an entire family on board. The smell of incense and spices, and the small fresh sacrifices on the footpath outside every shop, workplace and home: tiny woven grass baskets with flowers, coins, toys and sweets to curry favour with the Hindu gods. But merely traces of genuine Balinese life wasn’t enough for me, and try as I might, I had trouble getting any deeper while in the main tourist district around Kuta. So, I caught a bemo into Bali’s capital; Denpasar. A bemo is a tiny blue van that never has seatbelts, a complete paint job, or all its doors. I haggled a fare with the driver and took my seat next to the gaping hole where the side door should have been. I knew I would still have paid triple what my Balinese co-travellers were paying; but that’s par for the course when your tan is only a few days old. If there was a word for Denpasar it would be ‘frenzied’. This is a city bursting at the seams with activity. You’re never far from the aroma of nasi goreng (delicious Indonesian fried rice) or scooter petrol in coke bottles. Children are playing outside every building. Stray dogs and cats explore the alleyways. 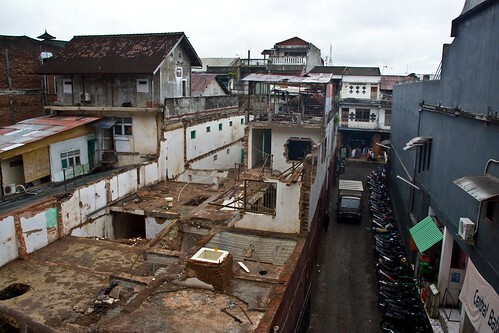 While seeking the famous Denpasar marketplace, I found myself lost in the backstreets. Clearly sensing my confusion, a friendly old man with no teeth and a hunched back told me he wanted to practice his English and offered to show me the way. We talked about his family as we navigated the back way to the markets. Obviously aware of the trepidation of Western visitors, he was compelled to remind me every minute or two that he was not seeking any sort of money or charity from me. “Learning your language are enough for me”. The market was an assault on the senses. Four stories high, with dirt floors. It couldn’t be more different from the tourist-centric markets elsewhere on the island. Few non-Balinese seemed to have made it here. The lowest level is all food – some of it still squawking. As I circled higher, I encountered spices, then trinkets, then clothing, and on the top floor: ceramics and carvings. I started to enjoy haggling and getting the lowest possible price became like a game. Like many developing nations, the tourism industry in Indonesia, particularly Bali, is both a blessing and a curse. Foreign travellers pump much-needed money into the local economy, but prices become inflated to the point that locals are trapped in a cycle of poverty they can’t get out of; despite many working in five star resorts. My closest exposure to this idea of poverty-right-next-to-excess came a few days after my visit to Denpasar. We’d arranged to spend the day at Waterbom Park – an enormous (fantastic) water park with pools, dozens of slides, and basically everything you could want to keep you sane in the heat. There are temples everywhere in Bali – even at Waterbom Park. When I stumbled across the temple there, I found myself wondering how often it was visited. How many locals had ever been here? Very few could afford to ever visit. Feeling an acute case of guilt, I decided to leave the park earlier than planned, and instead visit the surrounding area to find out who lived there. There’s no euphemism to describe what I found; it was slums. Not 100m from Waterbom Park, there were children who had no idea what a waterslide was. Though many of them were chatting on mobile phones, I still got the feeling that I was entering their entire universe. Through every window, I could see old women cooking for their families. Rather than shun me or glare at me for walking through their area, they would smile - proud that an outsider had ventured into their environment. When a crowd of children gathered around me, I opened my bag and shared a packet of sweets with them. And that’s when the obvious truth struck me – they were already happy. Happy with each other, and content with their lives. I realised that my earlier guilt was unhelpful and maybe even patronising. So I decided to help in a different way. I knew that most of these beautiful children had parents who were working hard in the markets, hoping to bring home enough to keep their family comfortable. I decided not to haggle so much on every purchase. Why should I take pleasure in getting the lowest possible price on market goods, when a fair price would give these families more to live on? For my last week in Bali, every time I paid more than I should have for a pair of sunglasses or a Balinese gift, I did it willingly – knowing that I was making a practical difference for the family of the shop owner. Instead of seeing them as cheeky rip-off experts, I saw them for what they were – honest people trying to bring home enough to care for their families. I left Bali with the deepest tan of my life. I had a wonderful time exploring the monkey forest in Ubud, the mountains in Kintamani, and the beach near Sanur. But the defining memory of my time there will always be in an unnamed slum right next to a water park, surrounded by gleeful children. Have you ever seen the 'other side' to a tourist destination you visited? Did you react in a similar way to Andrew? Let us know in the comments below.